Gina Falcone-Panza became the 6th Head of School at St. Thomas’s Day School on July 1, 2013. She came to St. Thomas’s from Ethical Culture Fieldston School, where she served as Assistant Principal since July 2011. As Assistant Principal, Gina articulated and communicated the School’s mission and the strengths of its program both internally and externally. She provided day-to-day operational support of grades 3-5 and oversaw curriculum and curriculum mapping. 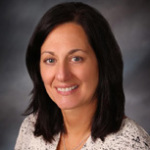 Gina supervised and oversaw the evaluation of 30 faculty and staff members and 195 students and she was the Steering Committee sub-chair for the New York State Association of Independent Schools (NYSAIS) Self-Study. Prior to becoming Assistant Principal at Ethical Culture Fieldston School, Gina worked at Fairfield Country Day School where she served as Dean of Academic Affairs, Language Art Coordinator/Associate Director of Admissions, and as a Third Grade Teacher. Her education experience also includes teaching at Buckley Country Day School and New York Board of Education’s P.S. 204 in Brooklyn. Gina received her B.S. in Education from Wagner College, M.S. in Education from Brooklyn College, and her Sixth Year Diploma in Educational Leadership and Curriculum Development from Southern Connecticut State University. Gina and her husband, Prisco, live in Milford. They have one son, Michael, two daughters, Lauren and Maria, and two grandchildren, Michael and Isabella. Their niece and nephew, Katie and Scott Panza, graduated from St. Thomas’s Day School in 1997 and 1999 respectively.